Charles Locke was born August 31, 1899, in Cincinnati, Ohio. 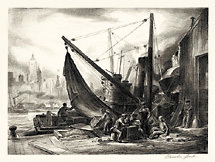 He studied at the Ohio Mechanics Institute, the Cincinnati Art Academy, and later at the Art Students League of New York with Joseph Pennell in 1922. He travelled to Europe and studied in Paris in 1928. 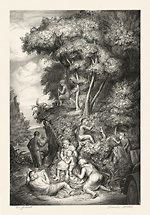 Both a painter and a printmaker, Locke taught at the Arts Students League from 1935 to 1936. He is a member of the National Academy of Design. He received awards from the Tiffany Foundation, 1920 and the American Academy of Arts and Letters, as well as the Logan Prize of the Art Institute of Chicago, 1936. His work is represented in the Metropolitan Museum of Art, the Whitney Museum, the Corcoran Gallery and the Phillips Collection in Washington, DC. 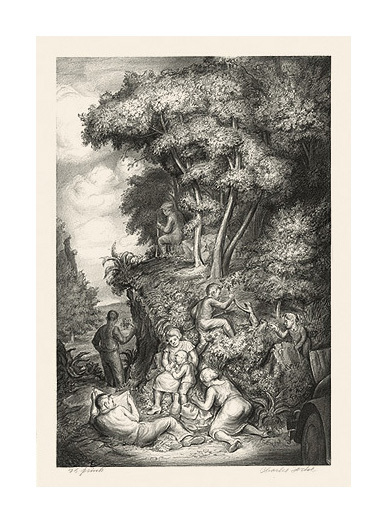 The Picnic - c.1935, Lithograph. Edition 25. Signed and titled in pencil. Initialed in the stone, lower left. Annotated 25 prints in pencil. Image size 15 1/8 x 10 3/16 inches (394 x 259 mm); sheet size 18 x 13 7/8 inches (457 x 352 mm). Image size 8 13/16 x 12 inches (249 x 305 mm); sheet size 11 7/8 x 15 15/16 inches (302 x 409 mm). 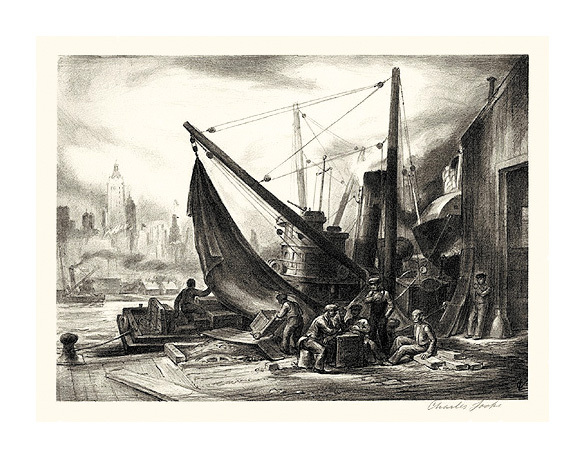 A fine, rich impression, on off-white wover paper, with full margins (1 3/8 to 2 inches), in excellent condition. Illustrated in One Hundred Prints by 100 Artists of the Art Students League of New York, 1875-1975, Art Students League of New York, 1975; A Treasury of American Prints, ed. by Thomas Craven, New York, 1939.